No 2012 Aiki Retreat. Now what? Well, bummer. It’s official. The CAA “Menlo Retreat” is on sabbatical for 2012. The hope is it will return, in some new form, in 2013. I’m disappointed to not be going next summer. I was really looking forward to seeing everyone, and doing nothing but training for a whole week. My dorm things are still/already packed from last summer. I feel very fortunate to have had the opportunity to experience it at least that one time, to have met so many really wonderful people and participated in a warm, inclusive Aikido tradition. I’m looking forward to 2013, and to helping create the event, in whatever way I can help. For now, we can all stay in touch and post photos and stories about past Retreats, share ideas and info about the future, and keep the soul of the event alive. If you are on Facebook, there’s the Aiki Summer Retreat Fans page you can “Like” to stay in touch. And check the fan website: www.aikiretreat.com from time to time. Please share the links with your friends throughout the year, so they can be in the loop about the new 2013+ Retreat. Invite them to go, when details emerge about it. If 2013 is going to be the beginning of a new and successful event, we’re going to have to support it. Meanwhile, take the week of vacation time and the money you were planning on spending to go to the Retreat, and find another Aikido event to enjoy and support. Start with those at your own dojo, of course, and pick any other event(s) you think might be worthwhile. Go, and bring some friends along with you. It’s our participation (and volunteering to help out, where possible) that keeps them happening. I know so far that I’m going to the San Diego Aikido Bridge Friendship Seminar (my 3rd year) in San Diego in January. At the end of March I’ll be doing the Evolutionary Aikido Seminar at Aikido of San Diego, with Patrick Cassidy Sensei and Dave Goldberg Sensei. For a summer “away” seminar or retreat I have about 8-10 options so far, but haven’t made up my mind. In any case, I hope to see you on the mat soon, and at the Retreat in 2013! I’m part of the team of women who write the column “The Mirror” on AikiWeb. This month was my turn again, so I wrote about something I learned from having had to miss class a few times recently. Enjoy. Click the title of this post to jump to the column on AikiWeb. I can’t believe it’s been months since I’ve posted anything here. There has been plenty going on, I just haven’t had the time to slow down enough to write much. I did update my running post, My Aikido Timeline, with some recent and upcoming events. 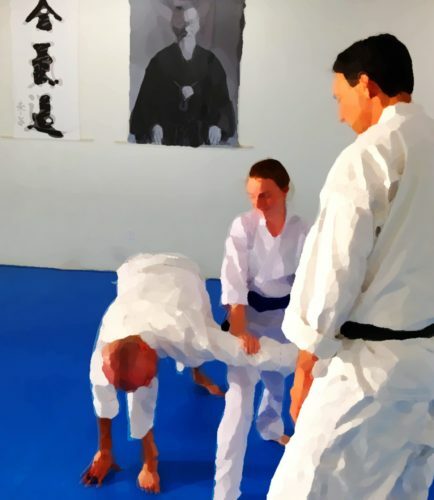 In September, Sensei led us in an Aikido In Focus workshop, Aikido, Fear, and Freedom. It’s hard to put into words the experiential impact of these workshops. This one left me feeling more… I don’t know… Open? Settled? Willing to allow myself to slow down, back off, relax a little, maybe. In October our dojo hosted a seminar with Mary Heiny Sensei, and I got to do a session with her before the seminar also. What a privilege. She is such a gracious and encouraging person, and a great role model. In between Aikido events other areas of life have been keeping me well occupied. One of our two donkeys, Clementine, colicked in mid-September. Colic can vary from a mild tummy ache to a suddenly painful and deadly problem, depending on the cause. I lost my horse, Sabrina, following surgery for colic a few years ago. Clementine needed a lot of serious help, but came through it OK with a week of intensive vet and nursing care. I’ll be happy never to have to tend another donkey IV, if I can manage that. At the end of September I went to Las Vegas with my husband, to celebrate his 50th birthday. We saw Cirque du Soliel’s “KA” at the recommendation of friends from the dojo. I highly recommend it. It was flat out amazing. Worth going to Vegas just to see it. Just before our trip, he was laid off from his job of 22 years. That was a little traumatic, but as is common with these things it’s led to new opportunities, and he’s looking forward to starting an exciting new job at the start of 2012! Throughout October work has been insanely busy, with a mind-boggling mix of unrelated projects interweaving throughout most days. Aikido has been the crash pad that brings me gently to a halt at the end of each day after running madly in many directions. Going to class, even if it means continuing to work late in the evening afterward, and on weekends, is not optional. I really need it. For a couple of weeks toward the end of October I had a hip problem (a snagged nerve or tendon, probably) that kept me off the mat a few days, and off my feet at times. Not a terrible problem, but ridiculously painful at times. In the process of getting through that I was introduced to rolfing, for which I am very grateful. Many of the physical problems I’ve experienced over my life have involved fascia, and that’s what rolfing works on. I’m looking forward to doing some ongoing work. Thankfully, on one of my good days during that episode I was able to take ukemi for a friend testing for 4th kyu. Now we have another new person to play with in the 4th-kyu-and-up classes! This has been the first “normal” weekend in recent memory! I got to do some gardening, sleep in, and now even do some writing. Next, right after I hit Post: a massage. Bliss. There’s a lot coming up, too. I’m lucky to be mentoring a few people for exams in December and January. Then the Aikido Bridge Seminar (my 3rd time going) in January. In March Patrick Cassidy Sensei will be returning to teach at our dojo, along with Goldberg Sensei, for an Evolutionary Aikido Seminar. And of course the Aiki Summer Retreat. It’s a ways off, but I’m already looking forward to it. I hope things can settle down to normal levels now! A couple of very articulate dojo mates have written some great stuff, and have agreed to let me share their writing here, as guest blogger posts, soon. So there’s something to look forward to.